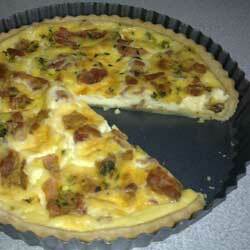 Current page is 11.3: Mascarpone, thyme and smoked bacon tart. Make the shortcrust pastry and line the tin, bake it blind for 10 minutes. Meanwhile, lay the bacon rashers on the bottom of a hot frying pan and cook them until browned and crisp. Add the thyme leave towards the end and fry for 1 minute. Drain the rashers on kitchen paper and crumble 3 of them into chunky pieces, place on the base of the pastry case. Whisk the mascarpone and crÃ¨me fraiche together with the eggs, egg yolks and seasoning. Pour this mixture over the tart case and turn the oven down 170C, Gas mark 3. Cook for 15 minutes before gently placing the remaining bacon rashers over the surface. Continue to bake the tart until puffed up, brown and still slightly wobbly. Allow the tart to stand for 15 minutes before serving. You are here: Home » Starters » Mascarpone, thyme and smoked bacon tart.